After three long years of waiting, the return of Septicflesh is a fact with a great album called ”The Great Mass”. 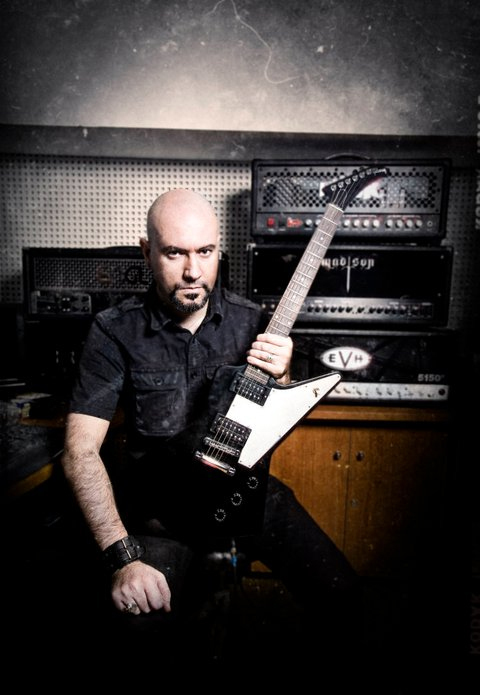 Guitarist, vocalist and composer Sotiris Vayenas (Sotiris Anunnaki V) describes us how he enjoys the love of the fans, the recording process of the album and their future plans that will lead them to the true success! You can either watch the video or read the text format of the interview below. Good afternoon from Metalpaths TV. We have the honour to host Sotiris Vagenas from Septicflesh. We were talking off the record before about the big response for the new album ”The Great Mass” and we’d like initially to tell us how you see the fans’ response from your point of view. After so many years, it’s something unbelievable even for us, so fast. Usually first comes our release and slowly starts the response of the fans. It seems that now there was a big waiting from the fans, maybe because ”Communion” was promoted very well. 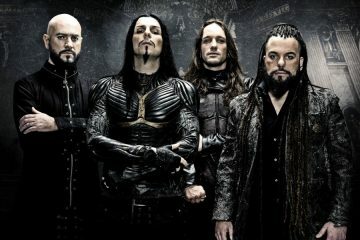 Generally after the reunion of the band we see the fans’ interest not only reducing but also more people is added to listening to Septicflesh and we are really very happy with what we see and we live this situation, waiting where the whole thing is going to end up. I believe on all this counts the fact that the album is full of quality. Keeping your basic elements, you evolve each time and no matter how much you change, which you did from album to album, the middle listener, either old or new, understands that he listens to Septicflesh. We’d like you to tell us how you saw the album getting created from the beginning, if there was a certain direction and if not, if this result came out naturally. We always start naturally, meaning that naturally equals that we express our feelings. We are open in many different genres of music and we can express ourselves in many different ways, like using different instruments. So, the choices we have when we start composing an album are always much. So, we don’t know from the beginning where the whole project is going to end up, we basically build on our best parts, meaning we put material in. Meanwhile, we have the positive that we have four musical brains, meaning me, Hristos, Spyros and Fotis, our drummer, compose songs. So, there is an exchange of ideas, lasting for a big space and I believe that this shows on the new album, the fact that we have worked the songs in large time limit. When we reach the part that some ideas are better than the rest, that’s where we put the direction. 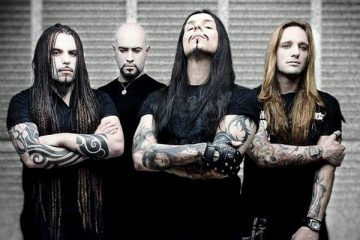 We say for example, from this five or six elements we have created until this part, we judge that the one who will show the new ‘advance’ in the new chapter of Septicflesh is this. So we build upon these ideas from a point and on. But this occurs after we have worked on the songs first. What you say is very important, because there are many bands based in only one composer that has to do all the work. How much relieving is for each of you especially and as a sum what you stated before? First of all, it is relieving even to know that if you get stuck to a part, which is logical -you may take the idea up to a point and get stuck- next to you is a team which will help you surpass the stucking part in the composition, we are somehow perfectionists, for example a song which we consider simply good, doesn’t satisfy us to say that it’s so good. We always want something more, to feel that our hair stand up, first of all we must feel it as listeners. This is for us the element that has what we say ‘the green light’, that it must enter the album. So, when you know… When I know that for example that I’ve got Hristos behind me, I’ve got Spyros, I’ve got Fotis, I feel less pressure psychologically to create and when you create an album like ”Communion” the expectations keep rising. On what you just said, I’d like to tell you that in my ears personally it’s true, from the fact that ”The Great Mass” is an extreme album but it sounds more calm because it lacks the pressure compared to ”Communion”, which came after the reunion, not necessarily because you had to prove something, but to show you’re alive. How is this getting linked to the fact that you are a demanding band which this time had a demanding producer, Peter Tagtgren (Hypocrisy) and how much did all demands got in common? Fredman was also a demanding producer, I don’t want to say Fredrik (Nordstrom) wasn’t, they are both big names in the extreme music production issues. Are there any big things in common or big differences between them? They are totally different characters, completely different. What I saw now in Peter is that he’s very open to the proposals of the band. When I say open, I mean even small details, he’s not the type of person that will say ‘guys, this is it’. He’s not going to tell ‘it’s like that, it’s over’. Something that was really impressive to me was that he’s working on all the songs of the album in each mix. He doesn’t take song to song to finish and then go to the next one. In our album we had ten songs, so he did a mix for ten songs. If we didn’t like it, he would do a mix for ten songs again. So you understand that the load of labor when you get to listen to ten songs and try to fix the sound linking all ten songs, it’s for me tremendous work. It means that the person doing this is really obsessed and wants to produce the best result. He always was like that. Did this whole procedure buy some time for you? Yes it did, though from a point and on we started feeling that we press him, how many times should he try to fix a detail? Of course the result speaks on its own, that’s what he also told us, the goal was a result to be achieved. Now, if it came out with the first or the fifth attempt it doesn’t concern us, the result is that counts. I consider the new album easier to access, not musically but as far as production is concerned, without being less dark, it sounds more direct compared to ”Communion”. I don’t know if you believe that it’s Peter’s fault, because I believe that your playing has evolved compared to ”Communion”. There is aggression, as of course there is one of the classic parts, meaning the orchestrations, which is a necessary element of Septicflesh and all these have been put to order perfectly. It’s what I said before, we worked the songs on big time limit, which means we kept on listening to them on and on and in the end we were trying to simplify things a bit, ”The Great Mass” is an organised chaos. We sat and said ”Where should we give priority on this part ?”, we did a very correct programming in order to emphasize per part, per song. In some parts we thought to emphasize on the orchestra, in some others we thought the rhythm element to come forth, in others the melodic part to come forth. We had taken the basic decisions and we gave Peter something that was structured correctly I believe. He didn’t have much to work on the structures, like ”Put this on, put this out”. The material was ready, he just had to give the balance to the right sound with his own ear, we wanted the orchestra to be part of the band, no the orchestra in one side and Septicflesh on the other. It sounds like a whole unit. 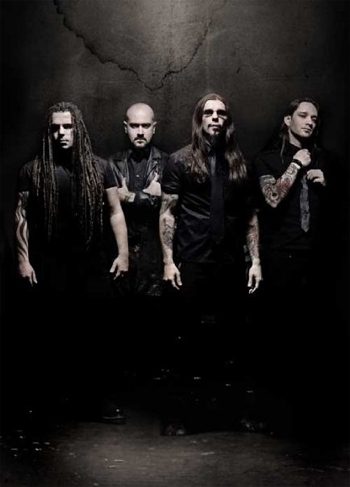 How much do you believe that the new album will be the guide for the future of Septicflesh? From ”Summerian Daemons” to ”Communion” there is a connection, also existing between ”Communion” and ”The Great Mass”.We see the band taking it forwards, it may be early to tell but there are so many expectations right now, like telling you before about the frenzy of the fans, and I’ll tell you something I believe and I hear from others too. While we were getting down with the fact that you release albums in two or three years time, this time we don’t want you to release an album soon, so that the new one will grow inside us. And also the fans have a complaint that the last two albums are a little short. They’d like somehow more. In duration you mean… ”The Great Mass” is a little longer than ”Communion”. I’m in favour of the opinion where you must give priority to the point. We don’t have filler songs to just fill an album. The purpose is not to create twelve songs, our purpose is to have a united sum and I think that ”The Great Mass” is the work that sounds as a sum more than we did in the past. There are certain songs of course, but what sticks to your mind in the end is the general picture and that’s what we want to achieve. As far about the next album, we will start with the same philosophy, which always remains the same. Yes, we have our feelings, we know where to give priority, and we’ll do the same thing again, build on the strong parts which will come out. Since it’s inspiration issue, I can’t say it’s going to come to me, it’s a kind of magic that happens in certain moments. Ain’t it great though, when all comes to you gathered? Can you put them in order then? For sure. It’s on us if we put them on order, the primal material that comes is always raw. You have to work on it, to fix it so there comes a direction, it’s not mixed ideas. What I can say is that we feel great self confidence, seeing that we made it. Each time that we make it and see we make something more, we feel more power for the next album. I think that comes out from your playing. The album is not easy listening, though it sounds direct as I told you before, maybe its short duration helps, regarding ”Communion”. And I see the fans already getting to know the songs, saying ”What a great part this is” here and there… It’s unbelievable because you see it in persons of young age that seem to live and breathe for it. In the beginning, when we created we said ”It’s a difficult album”. Well, yes, we didn’t make any easy one. Maybe the most easy was ”Revolution DNA” which also had some strange elements for its era, anyway, we don’t know how the fans are going to see each album, some songs need many listenings to get to know them, and especially if you see it as a sum, because each song is different compared to the others. It’s not like listening to ”The Vampire Of Nazareth” which was the first single, and you think the whole album is going to be like that. If you listen to one song only, you get the wrong impression, you have to listen to the sum. I really see the fans emphasizing in some songs very fast, that they have stuck to their minds as ideas and pictures, what happens now is really great. Despite your self confidence, does the love of the fans fill you with extra responsibility? By all means. First of all, the responsibility starts from ourselves. The correct creator must feel satisfied for himself for what he does. He must have original feelings, the one successful is the one doing things from the heart, coming from inside of him. From the point that the fans have followed us all these years of our career and has seen our various elements, there is a basic personality which is the Septicflesh sound, which follows us. 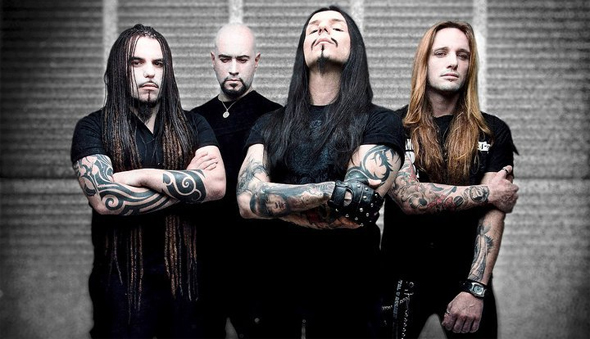 We may experiment and evolve, but I don’t think there will be fans to say one day ”This ain’t Septicflesh”. So, the ones being our fans get satisfied from the result, as long as it is original and passionate. The responsibility towards our fans is correctly structured. You were created in difficult seasons, especially for the Greek scene. Yes, we couldn’t imagine this. We had ambitions, our ambition was to play something special. We didn’t want to come up the stage, just pose and say ”Wow, we are a band” ! Our ambition was to play music, but not just music. We wanted to play music with some identity on it, that was our purpose. Then we would take it step by step, first we released our demo, then we released our first mini LP and then we released our first album. There was the important part where we achieved to sign with a foreign record company, which opened the doors for us to the fans outside Greece. Yes, Nightfall were first, then we joined Holy Records and generally the French have a sympathy to the Greek metal scene. They have stood by the side of many Greek bands. Since you refer it, I must tell you that two years ago I was in Hellfest in France. I must have seen in three days at least one hundred Septicflesh T-shirts, with no exagerration. I’ll be there this year too and I see that there is a strong fan base there for you, I don’t know if your new record company helps also on that. There is a strong fan base, from the beginning things were easy in France and especially if you think there was a season we wouldn’t play live. Our first world tour was in the ”A Fallen Temple” era, about a decade after our formation. The most gigs we’ve done are from our reunion and on, when ”Communion” came out. We built all this thing without having the super promotion done, and this has an importance to me. Now, how much we changed as persons all this time, our basic elements are the same. Our personality hasn’t changed, our beliefs haven’t changed, we just mature and experiences are gathered, so you see some things clearly. These are the changes done. Our soul and our way of thinking hasn’t changed. It would be very interesting to tell us some influences from composers, because to tell you’re only a guitarist or a singer would reduce your status. 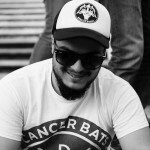 Which bands or persons shaped you since then until now, and if you have a suggestion to make about listenings, metal or not, so the people could hear, because I believe your opinion will be of interest to many people. First of all I should say that I started by playing violin. When I was young I would play violin for about ten years before I fall in love with electric guitar. So, my first listenings were more in the classical music and violinists. Mozart or Beethoven, now that you made the statement? I like them both. Each one for his own style, I also like Tschaikoffsky very much. Anyway, there was a time that I would listen to rock very much, apart from metal, some of my influences were artists like David Bowie, some more gothic rock artists, or bands like The Police, which were real artists with great compositions and of course I kept evolving. In metal all the giants had impressed me, like Black Sabbath, Iron Maiden, Dio, Saxon, you know, I lived the ’80s, all this magic of NWOBHM. You saw it given birth. I saw it given birth. Then I got into black metal, bands like Venom, I saw the extreme music evolving and I was following, thrash, death metal. Death metal was the point it did a ‘click’ to me. I think it shows a bit. Yes, it did a big ‘click’ to me. I generally liked the extreme element, I wanted compositions with melody but I was very enthused by the extreme element. There was something direct on it, maybe a little ‘naive’ also. I don’t know but something inside of me was driving me to that style. Bands like Morbid Angel, Death, Celtic Frost, if I continue telling names the interview will never end. We had an interview with Nergal of Behemoth last year and he told us how much he appreciates you as a band. And when we asked him to tell us some of the best albums of the decade, he had put ”Communion” in a special place and that he considers you good friends of his. Something else before we close this, we’d like you to tell us some of the direct plans of the band, if a tour is going to follow because the fans really want to see you very much. And if there’s going to be a tour outside Greece, apart from festivals, where I’ll catch you up on Hellfest. I should tell you that this week, 22 and 23 of April, we have two festival appearances in France, on one of which I’ll be too. As you know, I’m a bit the invisible force on the band, I’ll try to be more on the front. It’s nominable for the other guys that they produce this result without you, without putting you aside of course. Yes, it really is. There is a respect and Septicflesh is a common creation, there is not only one from behind. On the next month there’s going to be a big headlining tour in France, about twenty gigs, it’s a lot of gigs. Then in summer, there’s going to start a tour in America, with a strong package. We are playing with Children Of Bodom, Devin Townsend and Obscura. I think you feel a bit lucky, it’s a great line-up with different bands. That’s what I like very much, each band has something different to give, different show, different intuition. Obscura are great guys also, I think you’ll fit a lot with them. 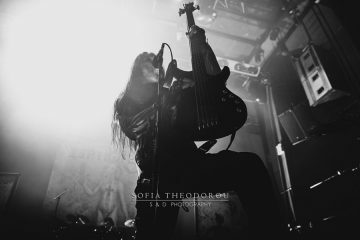 Meanwhile, Obscura impressed me, I had met with their bass player (Jeroen Paul Thesseling) and when I saw what he was playing I wanted to look further on them. It’s strange because alongside your album, Obscura’s album is the best for this year so far for me. It’s like they reincarnate the old spirit. They are a worthy band, they are very worthy and I’m happy that this tour will take place. We’d like to thank you all very much, and you on behalf of all the band. We want to wish you the best because you are worth it, not only musically but also for your attitude to the fans, everything should go well, first of all being healthy, stay who you are, and have even greater response. Thank you too, thanks to the fans basically, because it’s the fans that drive you, it gives you the motive, when you see there is response, when they want to listen to more material, you get power of this. Be sure that we’ll try more each time to open a new chapter in our history and we will show you new elements. So, see you on tour. Thank you very much! Video edit by: Manos Spanos.